If luxurious, high-end carpets and rugs with a silk velvet appearance are a must-have for your home, you’ll love Jacaranda. 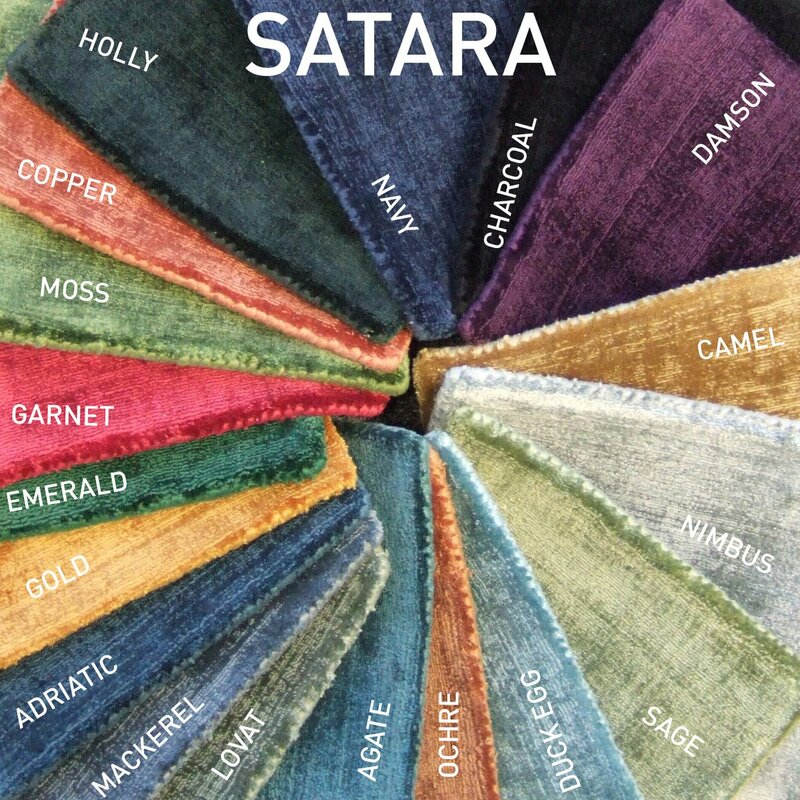 And our Knutsford showroom now has some stunning colours on display in Jacaranda’s brand new Satara collection, as well the latest colours available in the Santushti collection. Here we explain more about each collection; how they are made, why Jacaranda makes such special flooring products and we showcase some of the fabulous colours that will bring your interior to life. Satara is Jacaranda Carpets’ new range for 2018 – a beautiful collection of handmade carpets and rugs in rich colours and jewel tones. And what could be more perfect when one of this season’s key trends is the introduction of richer colours into rooms? Whether that’s emerald greens, deep blues or golden oranges – injections of opulent colour feature across all the interior magazines and they do in the Satara collection too! Showing: A handwoven Jacaranda Satara rug in Gold makes an impressive impact to this white-walled space. Jacaranda have brought eighteen colours to this new collection of vibrant carpets and rugs. There are shades of green such as emerald and moss, blues in navy, Adriatic and duck egg tones, along with other colours such as camel and garnet. Each colour is available in a 4m width broadloom carpet, and four stocked rug sizes so you can buy ‘off the shelf’ as much as have a rug made to order. There’s also the option of having these lustrous rugs or carpet made to match to your choice of colour. Showing: A luxurious, handwoven Jacaranda Satara rug in moss green – the perfect complement to a rich wood floor beneath it. While Satara is all colour, colour, colour, the Santushti collection focuses on the neutral palette. It brings the same lustrous, luxurious carpets and rugs in terms of look, feel and performance as the Satara, but comes in more muted tones. Due to their popularity, the Santushti carpets and rugs have been updated to include six new colours to the collection, further extending the choice of neutrals. 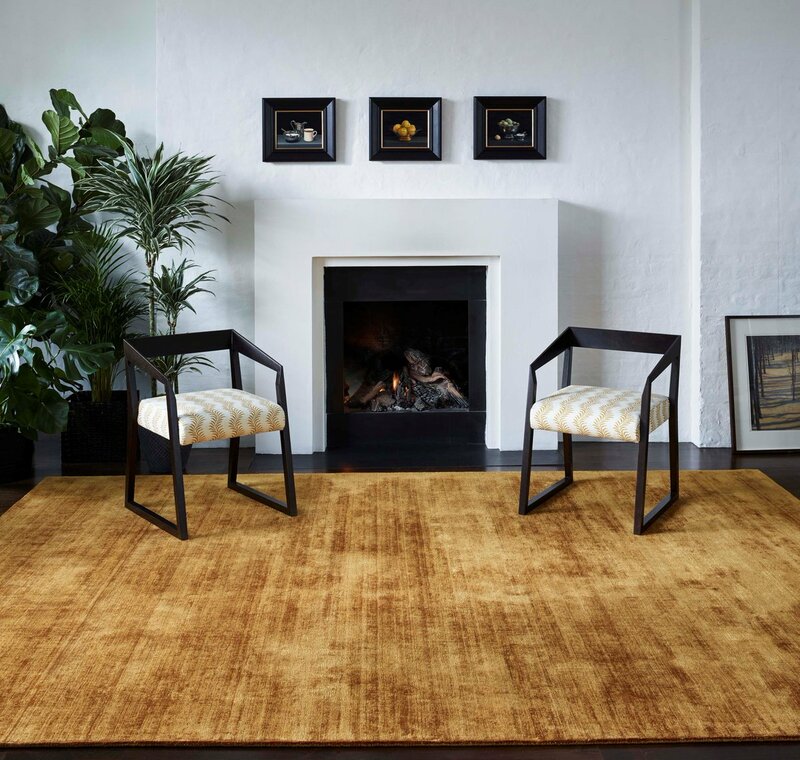 In the same way the Satara collection is available as a rug in four stocked sizes, it also comes as a broadloom carpet in both 4 and 5 metre widths. Showing: Santushti handwoven carpet in Fossil brings a real touch of elegance to this interior. What gives Satara & Santushti their silk-like appearance? Being made from 100% TENCEL®, a natural fibre spun from cellulose that reflects the light to look like silk, the carpet and rugs in both the Satara and Santushti collections shine and shimmer, as much as feel super soft to the touch. As the pile crushes and moves, light is reflected which gives the floorcovering the appearance of silk velvet. While TENCEL® wears better than a floorcovering made from viscose, it is still not recommended for wet or heavy traffic areas, such as hallways or entrances where they may be wet feet passing through. Jacaranda’s Satara & Santushti carpets and rugs work best in low traffic rooms such as lounges, snugs or bedrooms. 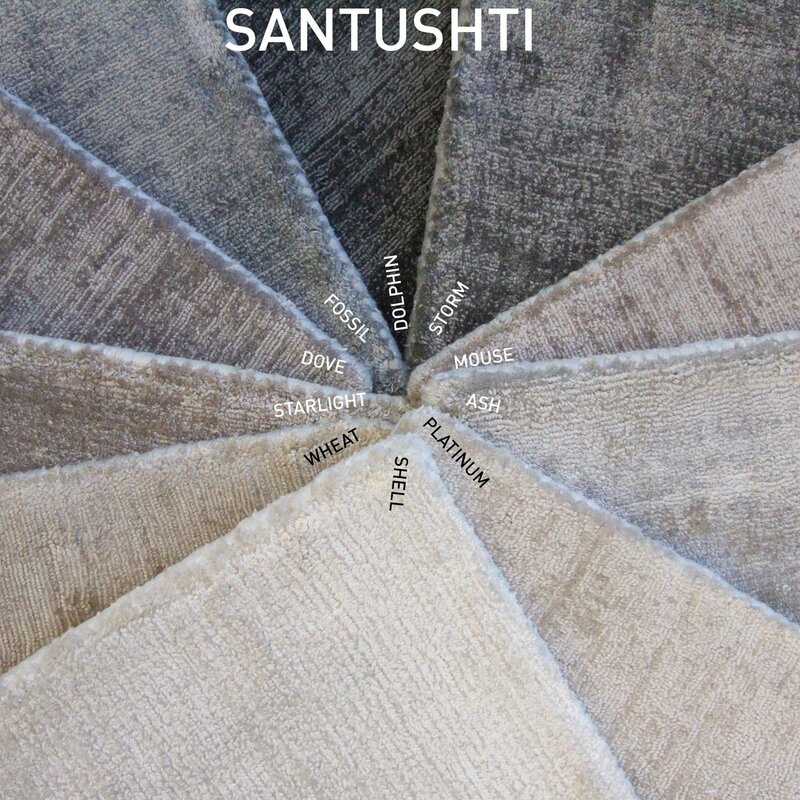 Showing: A snapshot of the colours available in the Santushti and Satara carpet and rug collections, made from TENCEL®. What makes products from Jacaranda so special and therefore a premium choice of floorcovering, are the manufacturing techniques used. Both the Satara and Santushti rugs and carpets are woven on traditional, hand-operated wooden looms – handmade textures made from natural colours and materials. Being done by hand, the work to make the products is labour intensive, but it brings assurance of an ethical and environmentally sound process. There’s definitely no compromise on the quality of Jacaranda carpets and rugs – from their colour to their design to their overall style. For the very best luxury carpets or rugs that tick the latest interior style boxes, perform well and look stunning in your home, you must visit our Knutsford showroom to see the Jacaranda Carpets samples and feel the softness of the Satara and Santushti textures for yourself. Or call us to find out more about the ‘ready to buy’ rugs available; or enquire about a free quotation for Jacaranda Carpets for your home.